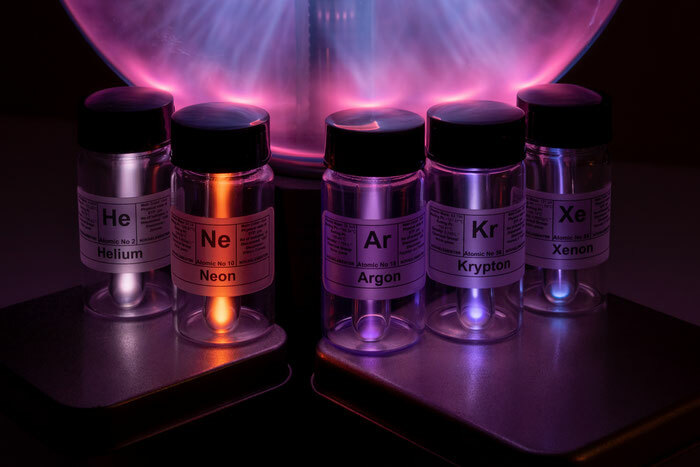 high purity noble gases set: Helium 99,9%, Neon 99,9%, Argon 99,9%, Kripton 99,9%, Xenon 99,9% in glass ampoules inside glass vials. Pure noble gases element set. NOTE: THE LABEL FOR THE KRYPTON IS NOW CORRECT. These gases CAN NOT be lighted with high voltage transformer because they are at standard pressure (1 atm). if you are looking for gases that can be lighted up, please find the items below.